Love this. 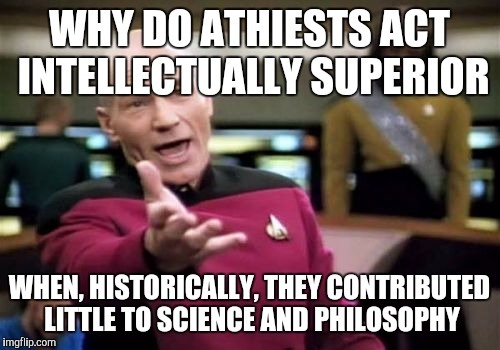 Will be jabbing at athiest friends on Facebook with this one. Hope you don't mind. That was great! Post it bro! This will get a lot of views...UPVOTE! KEEP IT GOING! Gebus is the, "get out of personal responsibility" card. My old arab satan friend! I think you nailed it. That's an upvote! Where have you been.. ? I read your comments with Shaitan - he's not an easy guy to get along with, you are more patient than me. I'm new and couldnt get along with that guy. Not all commenters are mature or respectful. Ignore those types.. don't let them get you down or riled up. Keep going and have fun! Let negative Attitude and lack of maturity and creativity reflect his character.. not yours. Thanks... keep going! It wouldn't be interesting, if we all agreed all the time. That would make us "subjects".. to tyrants that tell us what to think. .like Stalin & Mao. By looking at your comments.. I'm not the only one you get "abrupt" with. Why you get like that bro? If you want people to respect your opinions.. try respecting theirs and not being so negative. You may not care actually.. so .. it is what it is. Downvoting and disagreeing won't change the way someone responds to you. No one wants to converse w/someone who is constantly downvoting their comments or being nasty about a different opinion. Nice.... is a better life! Later dude. I am under NO obligation to respect ignorance...and have no reason to g.a.s. about your feels. Get over yourself. and you're under the impression "I'm" off topic...?? I take it you don't have a reference other than opinion? Democide is the crime of the 20th century.. these millions were killed under Tyrants, and not in the name of any Christian God. Give me a reference to consider your point,.. and I will. I looked on the Web and cannot find anything to support your claim. I am not saying there were not atrocities in what you referenced.. but not even close to Mao and Stalin. ONE person dead in the name of ANY 'type of rule' is too many. That you fail to see the Church as just as culpable for similar atrocities is dissonance defined. You didn't produce a reference bro. If you want to attack a religion for killing.. seems there is lots of evidence against Islam. If you find a reference.. where the Catholic Church committed anything on large scale like Mao or Stalin. . Let me know. History suggest that those Godless states did worse than any Christian state.. in history. I take it no references? Are you Atheist and just down on Christian organizations? I don't understand your anger on this. There are bad apples in every organization bro.. it doesn't mean everyone else is bad. I take it you expect me to do your research for you...? Not gonna happen...And uh...if you go around selling bad apples expect them to be tossed back at you. Oh dude... here I thought it was conversing. You downvoted? I never hit the downvote button once. It appears only your opinion counts and any disagreement angers you. Wow... kind of childish.. but hey. good luck Dude. I don't comment my opinions. They're not for children's ears. do you need to know how to spell The Crusades, The Spanish Inquisition, The Salem Witch Trials? Uh YEAH!! Any Cop that doesn't arrest his buddies for commissions of a crime is complicit!! It's their JOB to arrest "lawbreakers". And the CHURCH was ALL ABOUT Hitler's rule...fact...look it up. Reference.. you provided none. I looked up your claim of Pope and Church AND Found Nothing. Are you Atheist? 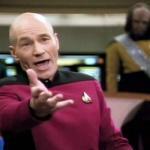 Your making assertions on me.. i didn't do that. Try "nice".. it's a better life. HA HA!! That guy is impossible!! Good reply! 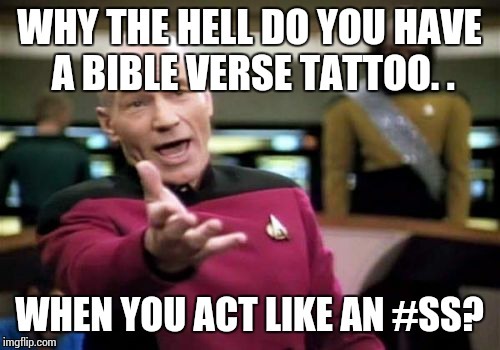 WHY THE HELL DO YOU HAVE A BIBLE VERSE TATTOO. . WHEN YOU ACT LIKE AN #SS?